Starting in iOS 12.1.1 publicly-trusted Transport Layer Security (TLS) server authentication certificates issued after October 15, 2018 must meet Apple’s Certificate Transparency (CT) policy to be evaluated as trusted. 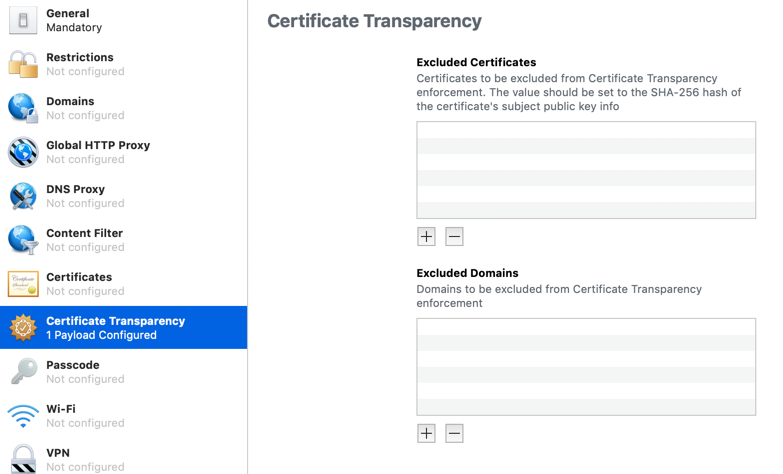 Please see Knowledge Base article HT205280 for details on Apple’s Certificate Transparency policy. Publicly-trusted Transport Layer Security (TLS) server authentication certificates issued after October 15, 2018 must meet our Certificate Transparency (CT) policy to be evaluated as trusted on Apple platforms. Certificates that fail to comply will this policy will result in a failed TLS connection, which can break an app’s connection to Internet services or Safari’s ability to seamlessly connect. The enforcement of this policy will be deployed with a software update later this year. Previously, only publicly-trusted Extended Validation (EV) TLS server authentication certificates were required to meet this CT policy. At least one embedded SCT from a currently-approved log and at least the number of SCTs from once or currently approved logs, based on validity period as detailed in the table below. From iOS 12.1.1, MacOS 10.14.2, tvOS 12.1.1, and watchOS 5.1.1 Apple have added a new payload “Certificate Transparency Payload” that allows you to disable Certificate Transparency checks for specified domains or certificates. Algorithm String Required. Currently, must be ”sha256”. Hash Data Required. Created by applying the specified hash algorithm to the DER-encoding of the certificateʼs subjectPublicKeyInfo. If your certificate does not have a .pem or .der extension, use the file command to identify its encoding type. Can you elaborate on how this will currently impact EMMs and organizations? What steps need to be taken? Do organizations have to check if the services they use have got their certificates CT logged? Do all CA’s respect this policy requirement from October? I’ve placed some questions about CT in Apple’s support forums months ago, but sadly no reply to this day. I think CT concerns only server side certificates. I do not know of a CA that does not support CT. I think most major CAs have support for it for some time already. However, it could be the case that CT is not supported by domestic CAs in some countries. For me the biggest issue is probably that self-signed server certificates will no longer by supported when doing local test enrollments for developer purposes and this is something that really bugs me. @petar In Earlier versions and Latest 12.1.2 beta , devices are enrolling using self-signed certificates. That’s good info. Was the certificate issued before October 15, 2018 or after? @petar , Self signed certificates issued after Oct 15,2018. Nice! Let’s see if it stays that way. I hope so. Thank you for contacting us. My name is XXXXXX, I am an AppleCare Enterprise Support Engineer and I will be working with you on this. These are very good questions and will try to answer them best of ability. There is one thing to theorise and second to how it actually will work to a specific infrastructure therefor we would recommend testing in your own infrastructure to avoid unexpected issues. End-user certificates for Exchange ActiveSync authentication. In this case I assume only the Exchange server HTTPS connection certificate would be affected and the client certificate authentication would not be checked for CT conformity, right? Would CT affect TLS connections for Email protocols - IMAP/POP/SMTP? Since these are TLS connections and using "Publicly-trusted Transport Layer Security (TLS) server authentication certificates” I assume CT policy applies. Would CT affect Wi-Fi (e.g., EAP-TLS) and VPN authentication setups? Would CT affect MDM servers and more precisly the case where MDM servers are signing payloads with a certificate before sending them to the device. The device would need to verify the signature of a payload, but would it also verify that the signing certificate conforms to the CT policy? @Dara Amazing! Thanks a lot for doing this. It didn’t occur to me to send these to Apple’s Enterprise Support. Perhaps I didn’t have a good experience there in the past. I guess there’s no escape from testing the Wi-Fi and VPN setups ourselves, but so be it. If your ticket is still open, maybe you could also ask about enrollment on MDM servers that are using self-signed certificates (for development purposes).